Achievement: Chairman of the Bharat Hotels chain and the single largest hotel owner. Lalit Suri can be called as the uncrowned hotel king of India. 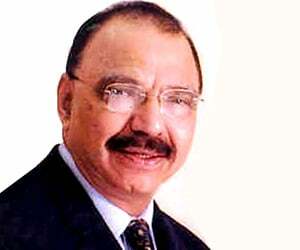 He is the Chairman of the Bharat Hotels chain and is the single-largest hotel owner with over 1600 rooms. Bharat Hotels chain comprises seven hotels which include the flagship InterContinental The Grand in Delhi, and six Grand hotels in Mumbai, Goa, Bangalore, Srinagar, Udaipur and Khajuraho. Lalit Suri is an alumnus of St Columbus and Sri Ram College of Commerce, New Delhi. He represented both his school and college in swimming and athletics at the state level. Lalit Suri was trained as an automobile engineer and started his career manufacturing vehicle bodies. He commissioned his first hotel in Delhi in 1988. Since then there has been no looking back. In the last few years Bharat Hotels has invested Rs 500 crore on its properties in Mumbai and Goa. In addition, the group has spent Rs 42 crore on a 30-year lease on the former Bangalore Ashok, and a further Rs 40 crore on renovations. Lalit Suri is currently on an expansion mode. Sites for hotels have been identified and negotiated in Amritsar, Ahmedabad and Jaipur, while search is on for the right locations in Chennai and Hyderabad. In the first phase hotels will be constructed in Amritsar, Ahmedabad, and Jaipur adding 400-600 rooms to the Grand chain, while the next phase in Chennai, and Hyderabad) will take the tally up by another 500 five-star deluxe rooms. Apart from a successful businessman, Lalit Suri is also an avid traveler and an art lover. Presently, he is also a Rajya Sabha MP.